Gigs can leave a big impression for many reasons. Some concerts are truly unforgettable for being fantastic shows or performances, a few stick in the mind for all the wrong reasons and then there are those that are memorable due to something unique or unusual happening; this Doro concert falls into the latter category. When I saw this event announced, I was a little surprised to see someone like Doro playing at The Underworld. It isn't exactly a big venue and thus I knew to expect it to be absolutely packed (given it was sold out) before I attended, although I certainly didn't expect things to pan out as they did... in a good way I must add! There was quite a queue when I arrived but thankfully once inside the journalists and photographers were allowed into a small area just off the side of the stage (there was no photo pit, which in my experience has generally been the case with The Underworld). The support act for the whole tour was a Swedish four-piece from Stockholm called No Sleep For Lucy. They could best be described as Pop or Arena Rock and throughout their performance they reminded me of another band that I couldn't quite put my finger on at the time; I later came to the conclusion they sounded like a slightly heavier Embrace. They delivered a ten-song set of which all but one track came from their debut release 'Until The End'. 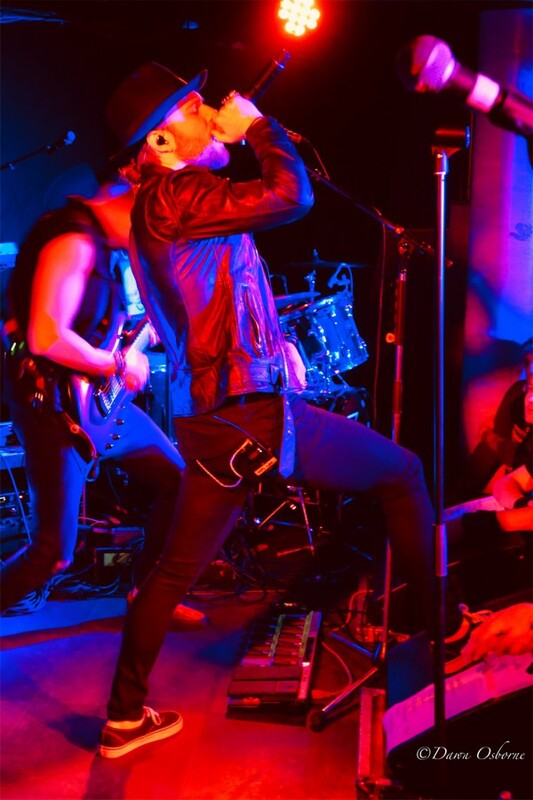 Their music contained lots of melodic guitar riffs and solos, plenty of bouncing, up-tempo rhythms and a fair chunk of catchiness, while vocalist Lukas Meijer also did a good job as he took every opportunity to encourage the audience to get involved. 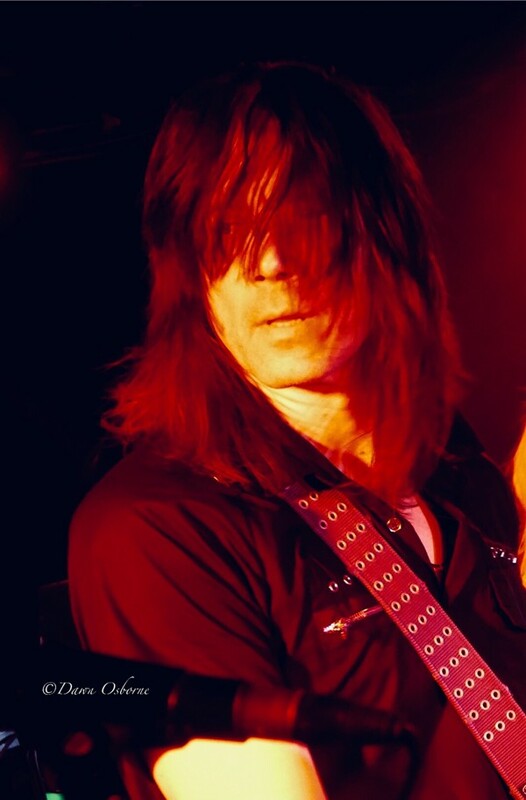 One of the songs played (and one of their singles) was 'Closure' which Meijer announced was written with Alice Cooper guitarist Tommy Henriksen (and according to online Mark Holman). The only none-album number was a cover of U2's 'Pride (In The Name Of Love)' that was greeted with a decent sing-along from the crowd. I don't mind admitting that I quite enjoyed their performance but that positive critique does come with a caveat. I have heard several people mention from both this show and the tour in general that No Seep For Lucy were not really the sort of group you would expect to open for someone like Doro. While I take my hat off to her for picking an entertaining and different sounding act to open, I think there is weight to that point as many Metalheads may not have quite appreciated a Pop Rock band as much as they would have something more "Metal". Irrespective, I will be keeping an eye open for their next release to see how they progress and I can't deny it was a great vantage point from the side of the stage to watch their set. However, it was during the break that things took a bit of a turn. Security informed all of us in this sectioned off area that we were allowed to stay for the first three songs from Doro and then we would have to vacate to somewhere else. Given the venue was rammed by this point I suspected this would present a problem, but I decided to deal with it when it happened. Right on time, Doro's band came out soon followed by the Queen Of Heavy Metal herself as she tore into one of my favourites in 'Raise Your Fist In The Air'. Doro was her usual whirlwind of energy as she headbanged, slapped and shook hands across the front and bounced from one side of the stage to the other. I adored the view from where I was stood (it was super close especially when she came over to our side of the stage) and it all looked and sounded great. This was followed by 'I Rule The Ruins' and 'Bastardos' which continued the fine form established by the opener. Unfortunately, as warned in the break, all the journalists and photographers were then asked to move from the set-aside location. Due to the extremely packed venue, this presented the expected considerable problem. The only spaces to stand that remained were the top bar area (you couldn't see or hear well), the side bar (no view), the raised side in general (no view) and the very back (no view and sound blocked by bodies); obviously this was an issue for myself and another writer who was also doing a review. Therefore, I must make a special mention and offer my deepest thanks to the security person who understood our problem and unexpectedly and very considerately offered us an alternative spot... the area at the back of the stage. I have only ever been on a stage once and this unusual viewpoint and perspective was something I won't forget in a long time. I will confess you couldn't see the whole stage from there, but the sound was still great and it was fascinating to watch a show looking out from the same point of view as the actual artist. The show rolled along with the likes of 'Soldier Of Metal', 'Night Of The Warlock' (which included the appearance of someone dressed up in a warlock outfit who then proceeded to prowl around the stage), 'Metal Racer' and the absolutely wonderful 'Für Immer'. At this point Doro offered the crowd the choice of 'Out Of Control' or 'Hellbound' before she informed everyone that they would play both. Sandwiched in between was a technically excellent albeit slightly overlong drum solo and the band introductions. It was then into the home stretch with 'All For Metal', 'All We Are' and 'We Are The Metalheads (Wacken Anthem)'. 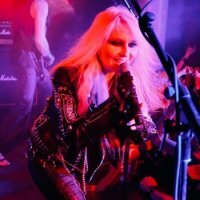 This took the show to the closing time, but Doro wasn't done yet and she announced she would take one more request and closed out the show with a cracking version of 'East Meets West'. Overall, the set lasted over ninety minutes and contained sixteen songs that consisted of eight Warlock tracks, four from her new double album 'Forever Warriors, Forever United' and an assortment of others. A Doro gig is quite hard to do justice to unless you have experienced it for yourself in which case you will likely understand what I mean. She is one of the most personal performers in Rock and Metal and gives it her all each and every night. There were a few chats to the audience (some she clearly recognised from the past) during the gaps between songs as well as plenty of hand slaps, handshakes and interaction throughout the tracks themselves. Doro handed out the mic a few times to the crowd and the love was returned in equal measure with lots of cheers or chants of "Doro... Doro" and "Hey" whenever she asked for their input. 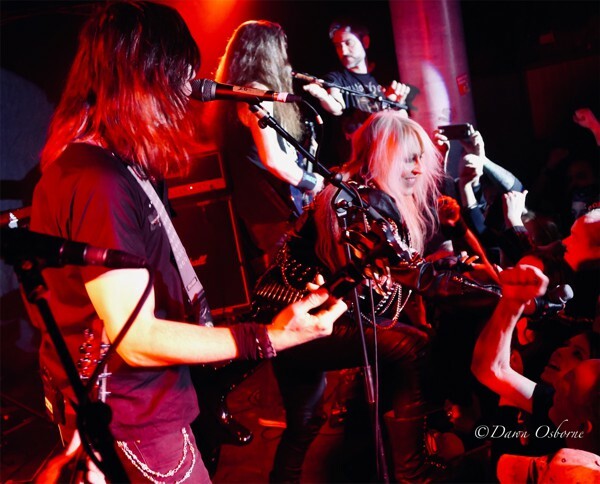 As for Doro herself, she was a ball of energy from the first moments right through to the very end, to the point that once the show was over she continued to remain on stage to sign stuff and was eventually somewhat escorted off by her manager... I suspect she would have stayed there all night given the chance. Doro never disappoints when it comes to a live show and tonight was another cracker. It was made all the more special by the wonderful opportunity to view the show from a completely different vantage point. It was a night I won't forget in a hurry and one that will live with me for a long time to come. 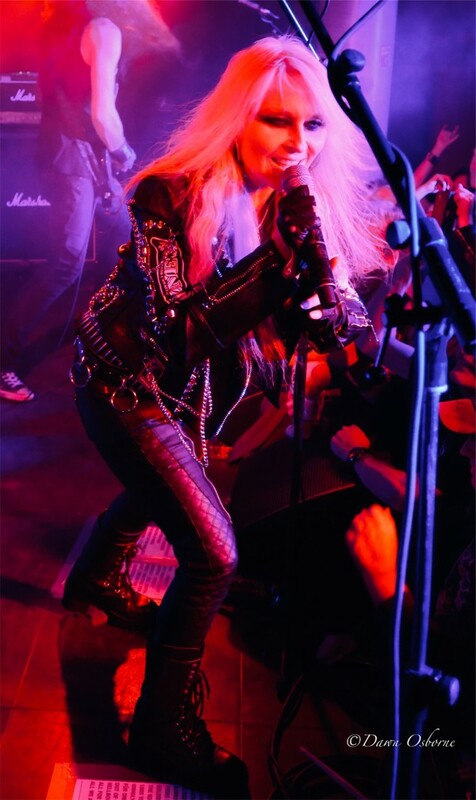 This show provided yet another example of why she is so loved by Metalheads everywhere and Doro proved once again exactly why she is The Queen Of Heavy Metal. 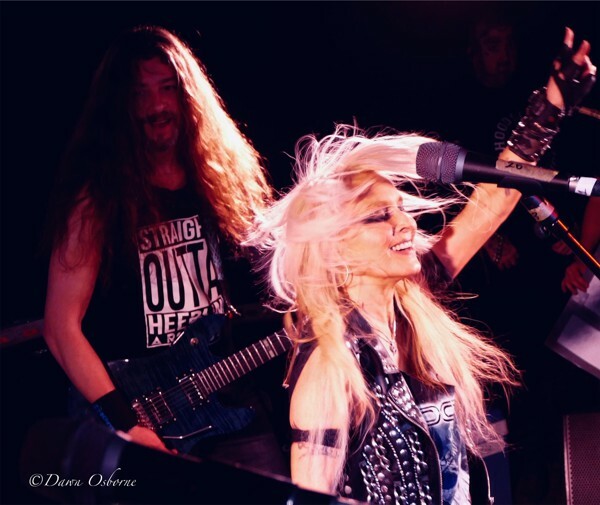 If you have yet to see Doro on the live stage, I can only urge you to take the next opportunity you get because you won't be disappointed... Long Live The Queen!